My favorite time of the year besides Halloween is definitely Hatch Chile season, and my friends, I’m here to let you know that it is upon us! Recently, I visited Melissa’s Produce, and they sent me home with some Hatch Chile Salsa, and some roasted hatch chiles from last year. Did you know that they keep in the freezer extremely well, AND they even get a little hotter as time goes on, because of sublimation. SCIENCE! I was challenged to make a recipe with the salsa, but the catch was that I had to use it in a unique way. 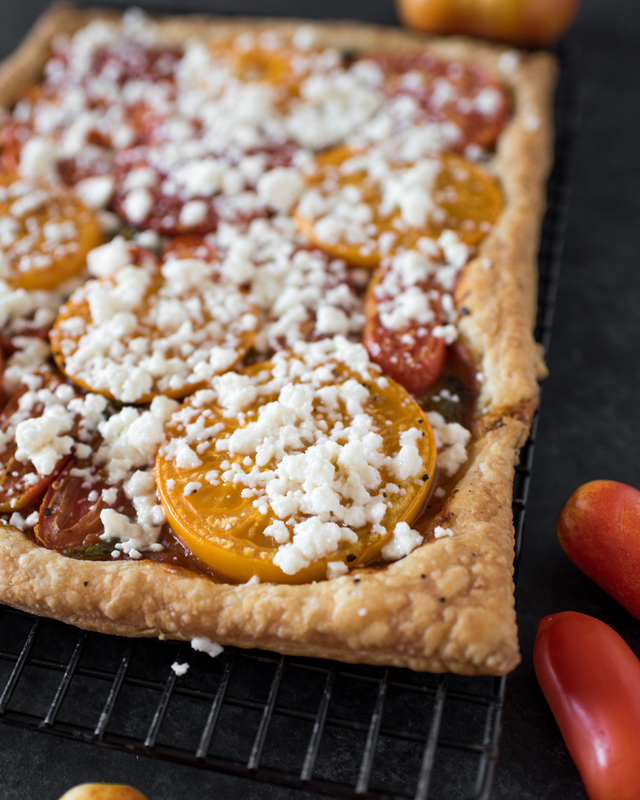 I’ve been dying to make a summer tomato tart because they are my favorite vegetable fruit, so here you have it! I decided to not only use the salsa as a sauce base for the tart, but used even MORE diced hatch chiles because I love them so much. I used spicy hatch chiles, which pack one heck of a punch, but you can use the mild if spicy isn’t your thing. I hope you enjoy the bounty of both summer tomatoes, AND hatch chiles this season! Hit up this link for some Southern California roastings. They are so fun! Also, check out roastings from years past. If you don’t live near any of the roastings, you can always buy some from Melissa’s. They’ll hook you up! This tart is simple, yet so stunning. 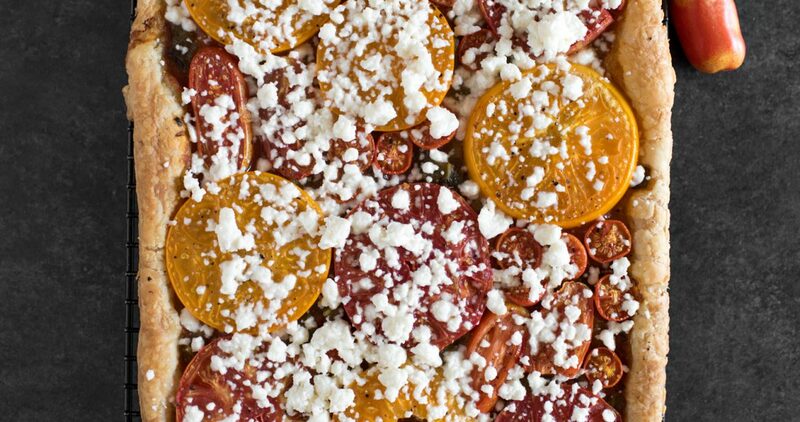 You'll be the rock star hostess with the mostest, just in time for Hatch Chile season! If you leave off the cheese, this thing is VEGAN! Can you believe it!? 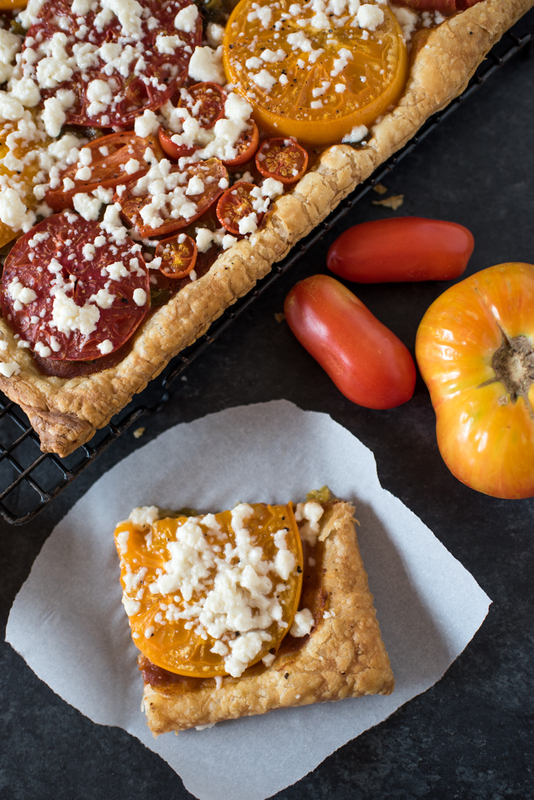 Thirty minutes before you wish to make this tart, remove one of the pastry sheets from your freezer to thaw on the counter. When you're ready to make the tart, preheat your oven to 400 degrees Fahrenheit. Un-ravel the puff pastry sheet, so you're left with a flat rectangle. Dust your counter top or cutting board with flour, put the pastry sheet on top of that, and dust the top of the pastry sheet with more flour. Roll out the pastry sheet, so you have a nice smooth sheet to work with. You don't have to roll it out too much. Place the rolled out puff pastry sheet on a parchment or silpat-lined baking sheet, and using the olive oil, brush the edges of the puff pastry, about 1 inch in, creating a 1 inch border around the puff pastry. Spoon the salsa onto the puff pastry, and evenly spread out to the edge of the olive oil, leaving the 1 inch border on the puff pastry. Distribute the hatch chiles evenly and top with the sliced tomatoes. Season with salt and pepper. Bake the tart at 400 degrees Fahrenheit, or until the edges are puffed up and golden brown. Remove from oven and let cool for 2 minutes. 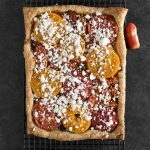 Using the parchment paper, slide the tart onto a cutting surface, and cut into 12 squares with a pizza cutter or large knife. Serve, and enjoy! This looks so delicious! I need to make this soon. Perfect for lunch! What a great use of salsa. I bet this would work well on pizza as well. Delish!